The TetraFlex® Outdoor System is the most user-friendly, flexible and cost-effective TETRA infrastructure system available. With its high reliability and unique design it is the ideal solution for mission critical communications, even in the harshest environments. The TetraFlex® system is scalable and can handle from small single site solutions with local coverage to large-scale multisite solutions, using any combination of outdoor or indoor TetraFlex® base stations. Together with the intelligent TetraFlex®software, simple and smooth site expansion is possible, even while in operation. 100% IP-based technology provides full architectural network flexibility with all network components connected in a single state-of-the-art infrastructure without the need of a central switch. Plug and play simplicity enables easy setup and fast deployment. 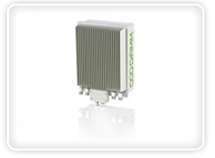 With its IP65 protection the TetraFlex® Outdoor BaseStation is ideal for installation in harsh environments. A compact design enables direct mounting on antenna masts, buildings and towers, reducing feeder loss and installation costs considerably, while also providing an ideal solution for rapid, vehicle-based deployment. Featuring full support for battery backup as well as redundant controllers and carriers, TetraFlex® meets your highest requirements on reliability. The intelligent distributed architecture replicates information to all sites in the network, avoiding any single point of failure. TetraFlex® is supplied with Application Gateways for easy access to the Application Programming Interface (API), Packet Data Gateways and Voice Gateways, allowing you straight forward development of customer-designed applications or integration to existing telephone systems and control room equipment. Seeing is believing: from 0 to TETRA in 30 minutes. Click here to view a demonstration of building a robust TETRA telecommunications system - real-time - in just 30 minutes.